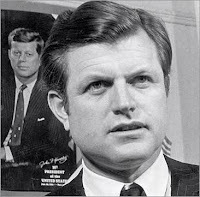 I can't let the day go by without saying a word about the passing of Senator Ted Kennedy, or as I came to call him, "Uncle Teddy." Like most of America I always had an affinity for the Kennedy family in general, but it was even stronger in the case of the youngest Kennedy brother. It wasn't until a conversation with my older sister, Nina, yesterday that I remembered why. In 1980 during his run for president, the senator visited the church my dad was pastoring in Baltimore city! The more she talked the more I remembered that visit. I remember how approachable and friendly he was - like an uncle. I think I may have even gone up to him after the service, but I can't remember... knowing me I did! Instead of being flanked with security and other personnel designed to keep the people away, he was open and accessible. I remember that he spoke from his heart and even us kids were quiet. Of course at the time the significance of the moment was lost on me - until now! So as the nation mourns the loss of one of the most influential people of our time, I add my simple farewell - rest in peace uncle Teddy - you will be missed.